Each day of the work week I spend roughly four hours commuting. By and large, I sit in the same seat, on the same car, at the same time, with the same people. Monday through Friday. Month after month. For three years now. This routine is far from Burroughsian. But there is danger as recently commuting in the DC Metro area has been as full of occupational hazards as crab fishing in the Bering Sea. In the past two to three years, several people have died on the subway or train lines in the nation’s capital. Whether by suicide or due to faulty safety systems (to say nothing of the threat of terrorist attack, of which I am reminded of every day by the presence of bomb-sniffing dogs and military personnel with automatic weapons), the daily commute has become deadly in DC. This does not even take into account the fact that for many of my fellow commuters the boredom, frustration, and monotony of their commutes are slowly killing them, draining them of their vitality, and leaving desiccated husks wrapped in business-casual attire. One of the things keeping me alive is the fact that my commute affords me four hours a day to read and to write. (In fact, I am composing this on the train on what would otherwise be a rainy and depressing Monday morning.) I have read more books, written more essays, in the past three years than at any time in my life, with the possible exception of my college years. My commute has become a study hall, my seat on the train transformed into a cubicle in a mobile library as I head to my cubicle at work. What for many people is a source of dread has become one of the most personal, sustaining, and fulfilling segments of my day. Yet the commute, with its Cerebrusian dogs, weaponry, and body count, its daily death march from train into the bowels of the subway, its seemingly incessant waiting, and its persistent and oppressive passing of time, reminds me of my mortality. Maybe that is why nary a day goes by on the train, particularly as I wait to load onto the subway car, that I do not think (if only for a flash, before I stuff the thought back under the bed with the other monsters) of Bill Cannastra. Wild Bill was one of the great characters of the literary Village in the immediate post-WWII era. Whether it was eating glass at cocktail parties or running naked around a block in the Village (Kerouac ran with him, but would only strip down to his boxers), Cannastra’s actions shocked and inspired the Beat writers from John Clellon Holmes to Allen Ginsberg to Kerouac. The party was leaving [Ann Adam’s] house after a night of sticking and wandering, and on the way to Claude’s Claude and Cannastra had become friendly and got drunk, pawing each other, recently. 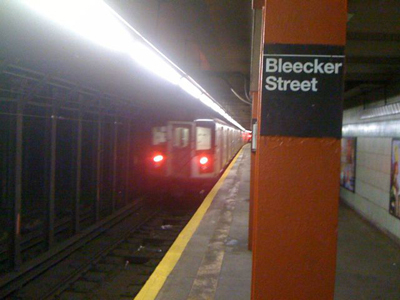 Subway to Claude’s to get money, a touch O’the dawn. 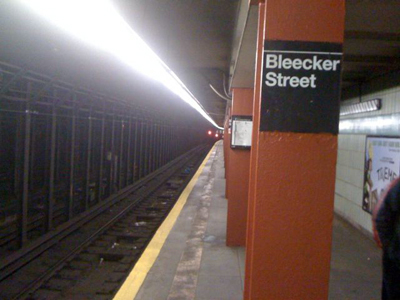 When they talked about the Bleecker Tavern (negress Winnie’s hangout) Bill lurched out of the window as a joke. He stuck his head and shoulder out, but apparently had misjudged his lurch and found himself hanging unbalanced out of the window. 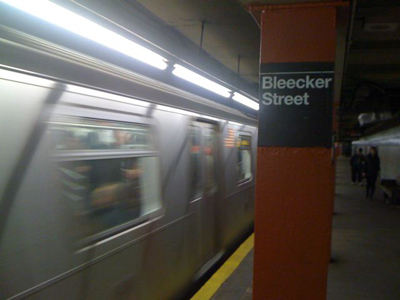 The others rushed to pull him back, and hung on to hi, as the subway roared through the tunnel. His coat ripped, and they couldn’t get a grip on him by his shoulders as he was too far out. When he saw what was happening he began screaming to be pulled back. He ducked, trying to avoid the pillars in the tunnel, hunched his head, but suddenly there was a thud and he was knocked out of the window to the tracks, out of their hands. When the train stopped, she went to the last car where his body was dragged and saw that his head was broken and brains showing out of the temple. 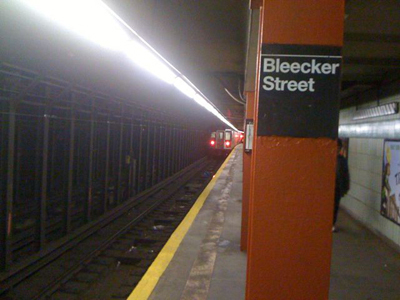 The subway stop was the Bleecker Street IRT station at Bleecker and Lafayette on the uptown side. The night before Cannastra’s death, Ginsberg spent five hours with him at the San Remo. The San Remo was a fixture on the Village scene, like the Minetta Tavern and the Kettle of Fish, which were just up the street on MacDougal. 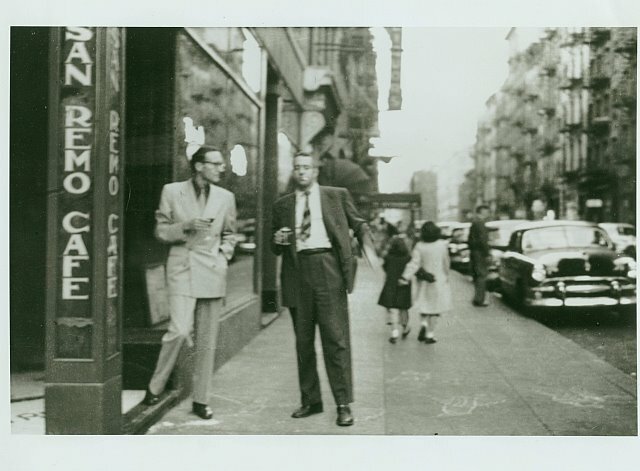 There is a picture of Burroughs standing outside the San Remo with Alan Ansen. At some time or other, all the Beats gathered there for nights of drink and talk. On October 11, 1950, Ginsberg and Cannastra did much of both. The subject of the conversation was death, and Ginsberg left the bar wondering if Cannastra was long for this world. Ginsberg recited sections from “On Judgment,” a poem Ginsberg wrote about Cannastra and Huncke (which later appeared in the Empty Mirror collection). At a machine in a shroud of light. Buried and bound in ravenous wrath. But there is a lantern in my grave. Is sunken in the dumbing clime. In the wrack and wild love of time. Great Angel fallen out of grace? There was such beauty in his face. Where shroud must rot and memory fade. And woven into the darkened loom. The “great question” of “was it an accident or did he do it on purpose?” (a variation of “to be or not to be”) hovered like a restless ghost around the Beat circle in the days, months and years thereafter. The death of Cannastra signaled the end of an era in Beat New York. Holmes, Ginsberg, Kerouac, Corso, and even Burroughs began the process of maturing not so much emotionally as artistically. All would start definitive work in the next year or so. This is most clear in the case of Jack Kerouac. Cannastra’s screams still echoed, yet a month later Kerouac married Joan Haverty, Cannastra’s girlfriend. Kerouac briefly moved into Cannastra’s apartment on West 21st Street, and most importantly, Kerouac took the tracing paper stored there. By the end of April 1951, the scroll version of On the Road was typed on the paper, and Kerouac had come of age as a writer. who sang out of their windows in despair, fell out of the subway window, jumped in the filthy Passaic, leaped on negroes, cried all over the street, danced on broken wineglasses barefoot smashed phonograph records of nostalgic European 1930’s German jazz finished the whiskey and threw up groaning into the bloody toilet, moans in their ears and the blast of colossal steamwhistles. Cannastra died for the sins of the thousands of sleepwalkers slowly progressing to their deaths in their grey flannel suits on the cattlecars from hundreds of Levittowns. Their sin was to betray ecstasy in favor of chasing the American Dream. Cannastra put his shoulder to the wheel and was chewed up and dragged under the IRT, only to be spit back out a hundred feet away with a chunk of his brain missing. Lobotomized. And running parallel to the commute full of grey flannel suits are the trains that just a few years before headed to Auschwitz, Bergen Belsen, Dachau. Millions of Americans in subways, trains, and cars head off to their own air-conditioned nightmares at work and at home. The American versions of the concentration camp. Cannastra, desperate to escape the train that led to the cubicle or the suburban home as much as he was desperate to hit another bar, hurled himself to his death. But surely such comparisons shade off into parody. Auschwitz is unspeakable and not the subject for jokes, no matter how deadly serious those jokes may be. In the aftermath of Auschwitz, Cannastra’s death becomes a punch line without punch. Maybe I just have too much time on my hands as I sit on and wait for trains. Idle hours make a restless and careless mind. I must know in my heart that Cannastra’s death was merely senseless, an act of drunkenness. Nothing more. Meaningless, an act of stupidity. I am making much ado about nothing. But out of that nothingness can we not see Cannastra’s death as an act of Dada, an acte gratuite, like Jacques Vaché’s shooting aimlessly into the crowd, only turned inward on the self? Ginsberg thought so, and it is only natural that I attempt to read meaning into the lost and wasted hours of my commute, and, thus, in Cannastra’s death. Cannastra could not have died for nothing. I cannot be commuting to nowhere. There has to be a reason Cannastra laid broken on the tracks (even if I chose not to accept his act of redemption as my own) and a reason I am sitting on this train (it is now Monday evening as I write this). Maybe that is why I read and write so furiously, as I am transported relentlessly into the void. Written by Jed Birmingham and published by RealityStudio on 24 May 2010.
has always been an inspiration, even in death, to llive a life full of imagination and risk. I too commute daily and feel as if I am merely progressing into the void, unconscious and apathetic. However I am able to observe and write there, untouched. Thank you for mentioning the importance of that personal time, for it is real and it is wonderful. There is never a lack of material. Cannastra will continue to be mentioned alongside the Beats during the early NY years because he was so full of life. He was a character. One that became immortalized in their writing, and surely in their minds. Without a doubt, he made an impression, one could argue to what degree, however he made an imprint and became frozen in that time. Unlike so many people that pass everyday, we are still discussing him in this moment, all these years later. Lynne Cannastra, I would be extremely interested in any info regarding Bill Cannastra that you could possibly give. I’ve been fascinated with Beat history for years and Bill Cannastra was one of the figures that really stood out and captured my attention. I’d be very interested to know any info beyond the regrettably brief info is available these days. What motivated him? How did he become such a wild character? Etc… I can provide my email if I hear back thanks! Lynne Cannastra, I am also interested in information about your uncle Bill Cannastra. You mentioned that your father, and his family (their parents?) spent many summers camping in Truro. In researching Jackson Pollack and Tennessee Williams in Provincetown, during the early 1940’s I know that they hung out together. His friendship with Pollack s mentioned specifically in a biography about Lee Krasner. Pollack and Cannastra’s escapades were so wild that she had Pollack’s brother come up to Provincetown to take Pollack back to NYC. I am interested in learning when the family first came up to Truro. Did Bill study painting or art? How did he meet these artists? I did read that he worked on a fishing boat which sailed out of Provincetown. Do you know if worked other places in Provincetown? Thanks so much for any feedback you can give me. Bill Cannastra was my uncle, and I can try to give you all as much info as I know. Bill and my dad grew up at 525 Pennsylvania Ave in Schenectady NY. It was a modest 2 family, and very small. My grandfather worked in a mica factory as a supervisor, and his extended family was “typical italian”. The family was in little falls NY and ran a produce operation, made wine, etc. There were 2 factions of the family…my grandads side and my grandmothers side. My grandmother disapproved of my grandfather’s family giving wine, etc to the kids. Anyway, My dad always said that Bill was very very smart. His childhood name was Woody. He was a voracious reader, and back in those days my grandmother enrolled in a book club just for him. She bought him all the classics, opera, gregorian chants,etc. I actually have a ledger of all the books purchased for him and it was extensive. The family had land in Truro, and travelled the old route 6 from home…it took hours..Upon arriving my grandmother forced a line up on the ocean and made the kids take deep breaths of the ocean air. Unbelievably, the parents left Bill and my dad Fred alone camping for weeks on end with a large bag of potatoes and they fished and made due. There was a school teacher that lived near by that kept an eye on the camping kids. They returned every year, and yes Bill worked on a fishing boat for a while. So, Bill went to University of Michigan for undergraduate studies, then went on to law school at Harvard. He roomed with Tennessee Williams in Cambridge. Bill did not study art as far as I know, but immersed himself in that world. I have some pictures of his loft in NYC somewhere. Surely there is a great biography of your uncle Bill to be written, before the memories of him vanish completely, and you would be the person to write it – or at least provide some essential material. Just a thought. I found the pic, but don’t know who the man is next to Bill. Yesterday I sent pictures of Bill Cannastra as well as photos of his loft to the Beat Museum. If any if you are interested contact me. I am hoping these can be enjoyed by all.